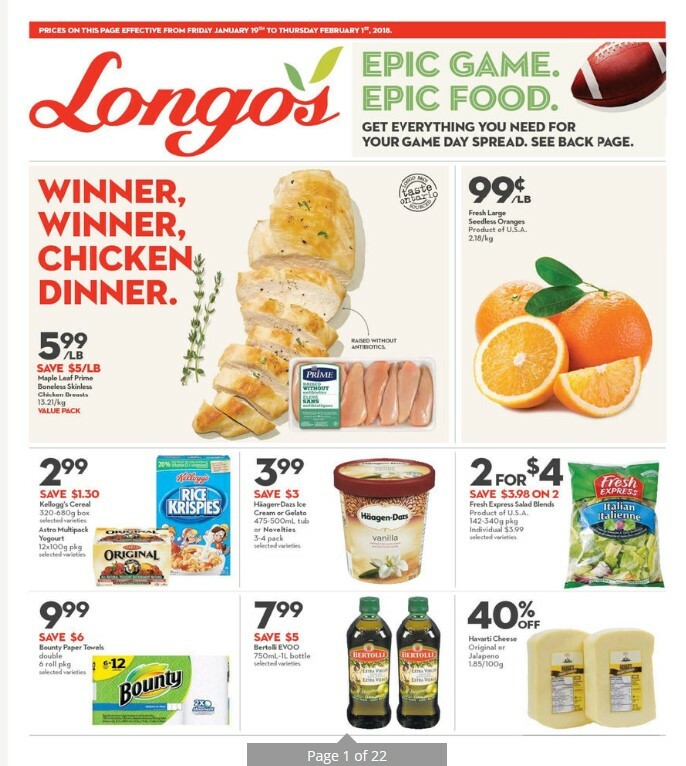 Longos Flyer Canada - January 19 - Febuary 1, 2018 - Maple Leaf Prime Boneless Skinless Chicken Breasts $5.99 lb Sale Price $5.00 Savings $13.21 kg. Value pack.Fresh Large Seedless Oranges $0.99 lb Sale Price Product of U.S.A. $2.18 kg.Kellogg's Cereal Astro Multipack Yogourt $2.99 Sale Price $1.30 Savings Kellogg's cereal 320-680g box selected varieties astro multipack yogourt 12x100g pkg selected varieties. 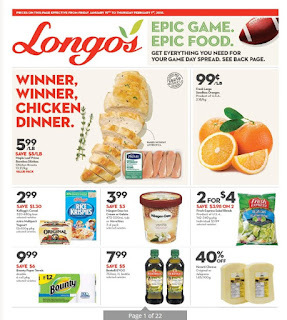 Haagen-Dazs Ice Cream or Gelato or Longos Flyer Novelties $3.99 Sale Price $3.00 Savings Haagen dazs ice cream or gelato 475-500ml tub or Novelties 3-4 pack selected varietiesFresh Express Salad Blends 2 $4.00 Sale Price $3.98 Savings Product of U.S.A. 142-340g pkg Individual $3.99 selected varieties.Bounty Paper Towels $9.99 Sale Price $6.00 Savings double 6 roll pkg selected varieties. 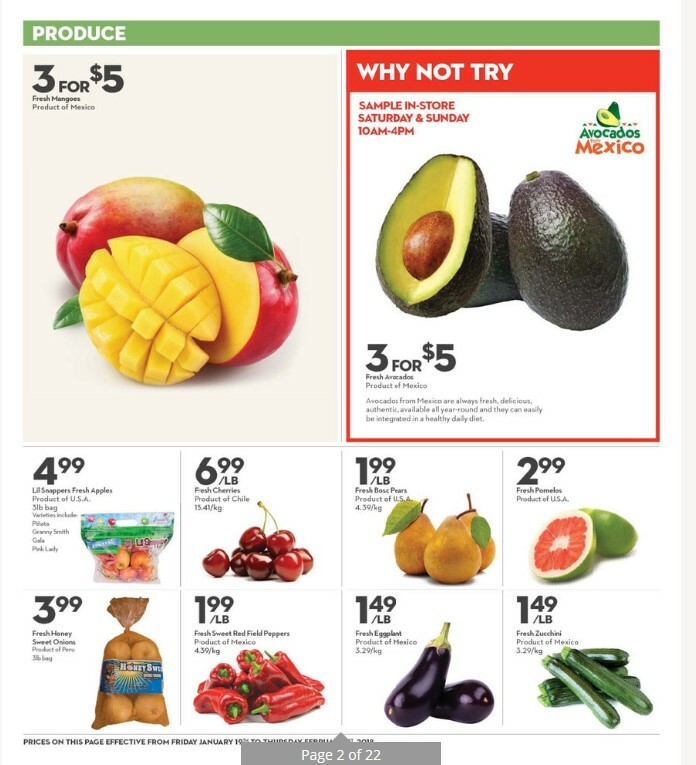 Bertolli EVOO $7.99 Sale Price $5.00 Savings 750ml-1L bottle selected varieties Havarti Cheese 40% Savings Original or Jalapeno $1.85 100g Fresh Mangoes 3 $5.00 Sale Price Product of Mexico . Lil Snappers Fresh Apples $4.99 Sale Price Product of u.s.a. 3lb bag varieties include: pinata granny smith gala pink lady. Fresh Cherries $6.99 lb Sale Price Product of Chile. $15.41 kg. Fresh Honey Sweet Onions $3.99 Sale Price Product of Peru 3lb bag. Fresh Sweet Red Field Peppers $1.99 lb Sale Price Product of Mexico $4.39 kg. Fresh Avocados 3 $5.00 Sale Price Product of Mexico. Fresh Bosc Pears $1.99 lb Sale Price Product of U.S.A. $4.39 kg. Fresh Zucchini $1.49 lb Sale Price Product of Mexico $3.29 kg . Fresh Blackberries 2 $4.00 Sale Price Product of Mexico 6oz pkg. Fresh Kiwi 2 $1.00 Sale Price Product of Italy. Longos Weekly Flyer Fresh Organic Mini Carrots 2 $5.00 Sale Price $0.98 Savings Product of U.S.A. 1lb bag Individual $2.99.Fresh Eggplant $1.49 lb Sale Price Product of Mexico $3.29 kg.Fresh Zucchini $1.49 lb Sale Price Product of Mexico $3.29 kg . Sunny Fruit Organic Dried Fruit $4.99 Sale Price $1.00 Savings 250g pkg.